The president of the African Development Bank expressed hope that South Korea and Africa can increase personnel exchanges and technology sharing in the fields of agriculture, energy and drones, the finance ministry said Friday. Akinwumi Adesina made the comments in a meeting in Seoul with Hong Nam-ki, the minister of economy and finance, according to the ministry. 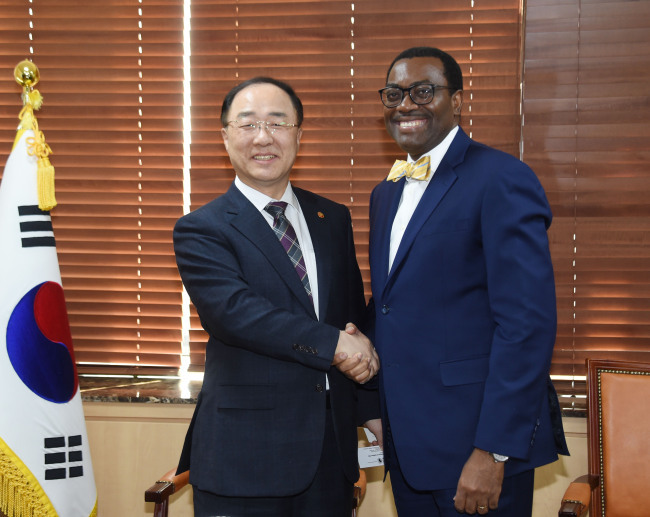 Hong told Adesina that South Korea will continue to expand its cooperation with Africa. Asia‘s fourth largest economy has made the transition from a key recipient of U.N. aid to a donor country in half a century. This change in fortune has inspired many developing nations to follow in the country’s footsteps to advance their economies.